Our products come with a range of seasonings. 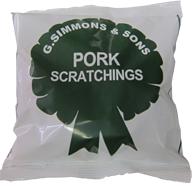 Our Traditional Pork Scratchings are lightly seasoned with a delicate salt & savoury seasoning to enhance the flavour of the pork. 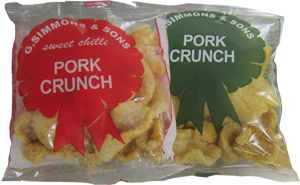 Our light and crunchy Pork Crunch is seasoned with a rich and tasty Roast Pork seasoning, a perfect combination. Or Try our Sweet Chilli Pork Crunch but be warned it bites!! G Simmons & Sons , site by esterling.